MBTA Commuter Rail train at T.F. Green Station. Photo from RIDOT. 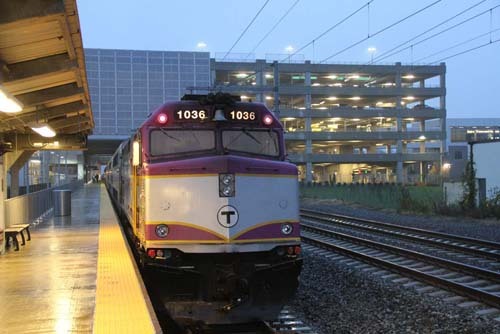 The Governor, RIDOT, and the Rhode Island Airport Corporation announced today that MBTA commuter rail service to T.F. Green Airport’s station at the Interlink will almost double starting November 14th. The biggest gripe about the Interlink service since it started last December has been the timing of the trains. Few people have been able to take advantage of the train service to connect to flights at the airport. The initial service was always set to increase once the station at Wickford Junction came online and initial service was more catered to commuters heading to Boston than to people needing to reach the airport. Wickford Junction station is slated to come online sometime in April (it is currently ahead of schedule! ); this early boost in T.F. Green service is welcome news. T.F. Green service will increase from its current 11 weekday trips to 20. Inbound to Providence/South Station: 5:05 a.m., 6:13 a.m., 6:52 a.m., 7:15 a.m., 9:23 a.m., 11:45 a.m., 3:50 p.m., 8:50 p.m. and 10:15 p.m.
Inbound to Providence only: 7:20 p.m.
Outbound from Providence only: 4:50 a.m., 5:53 a.m. and 6:25 a.m.
Outbound from South Station/Providence: 8:39 a.m., 11:17 a.m., 3:16 p.m., 6:27 p.m., 7:03 p.m., 8:17 p.m. and 9:40 p.m. Ticket fares remain unchanged, and vary by distance traveled. Travel between T.F. Green and Providence costs $2.25 each way. Travel between T.F. Green and Boston costs $8.25 each way. Seniors and persons with disabilities get 50 percent off. Children age 11 and younger are free when accompanied by a paying adult. Monthly passes for unlimited travel between Providence and T.F. Green cost $77. Monthly passes for unlimited travel between T.F. Green and Boston cost $265, which also includes travel on all MBTA buses and subways and the Inner Harbor Ferry. Parking at the InterLink garage is $6.75 for the first 24 hours. Customers parking beyond 24 hours will incur an additional charge of $30 per day. The monthly commuter parking rate is currently $110 per month. To celebrate the increased service schedule, the monthly rate will be reduced to $95 per month, effective December 1, 2011. Cash and credit cards are accepted. Also last week, the City of Warwick outlined its intentions to encourage Transit Oriented Development in the area around the Interlink, including enhancements for pedestrians and cyclists. DePasquale sees the center as a “gateway for the region” and a destination where people would want to come, rather than just pass through on their way to someplace else. The core to this center, which is about 35 acres on both sides of the Interlink skywalk, is where attention is being focused. Do you want more Interlink news? Well good, today the Rhode Island State Council on the Arts announced that it is seeking applicants from artists to display in the “Green Space” in the Interlink. GREEN SPACE, a newly created exhibition space located at TF Green Airport, seeks work for presentation in 2012. Green Space is a partnership between RISCA and the Rhode Island Airport Corporation that promotes outstanding work by artists living and working in Rhode Island. The space will present art to an ever-changing audience of local, national and international travelers. It will exhibit three group shows in 2012. For more information visit the RISCA website. I am happy they are expanding the schedule. The way they had it set up meant yes, commuters would benefit but nobody else. And Wickford is almost complete, when does construction on Westerly begin. I do recall that CT Transit said if they built out in Westerly, that CT Transit would start running there too. Granted it’s buses but it is a start. Besides, if MBTA can roll into Westerly, they can roll right on through into CT.
Now ridership might go up due to the better distributed schedule and the discounted garage cost. Kingston is supposed to be the next stop on the line. The funding was approved to add a 2-mile third track at the station. The MBTA may roll into Westerly in the future, but it’s also possible that the Shoreline East from New Haven could arrive in Westerly and go beyond to Providence as well, which would be good for the entire region. I think Kingston could be ready for commuter rail service somewhere in the 2014 timefram or so – just my personal opinion (and hope). That would be the next expansion of commuter rail service in RI in my opinion. Westerly needs what Kingston is getting, a third track and some modest upgrades. I just so happy to see this next phase take place! I am unaware of any near-term plan for commuter service to Kingston, and there is no money now programmed for equipment or construction, not to speak of operating. More advanced is planning for a commuter rail stop in Pawtucket, which has the support of local interests though there is a hefty $55 million or so capital cost. Cranston and East Greenwich also have interests in a possible commuter stop, more likely than Kington I think since trains will be going by anyway in all 3 cases. I think Pawtucket and Cranston have some potential for transit oriented development around a station as Warwick is hoping. The new 4 year TIP (transportation improvement program) that may or may not fund these projects is undergoing development now by Statewide Planning which provides plenty of opportunity for public comment. All of us who favor better commuter rail service should show support. Kingston is part of RIDOTs Phase II commuter rail study which includes Cranston, Pawtucket, East Greenwich, West Davisville, and Westerly. It also calls for exploring connections to Shore Line East. RIDOT recieved federal money to design and build a third track and platform at Kingston. Rhode Island Department of Transportation. $26.2 million for the design and construction of an electrified third track parallel to the Northeast Corridor’s main line, and a new platform for the station in Kingston, RI. The third track will permit faster trains to overtake slower trains, reducing congestion and improving on-time performance on the Northeast Corridor for Amtrak and commuter trains. Throughout the Northeast Corridor from Washington, D.C to Boston, $1.75 billion is being invested to improve service. A third track at Kingston will allow Commuter Rail to layover and Acela to pass at maximum speed. Kingston and Westerly are the only two potential stops in Phase II which currently have stations (Pawtucket is most likely to see a new station rather than the renovation of the existing Pawtucket Central Falls station). Thanks for posting that Jef. Kingston is probably the next most likely commuter rail stop in RI at the moment, mostly due to the funding for the 3rd track and additional platform. Still not a done deal, but again, I’d bet that we’ll see Kingston added next. Pawtucket/CF would be my next guess, and then after that, whichever community can get funding (public, private, or both) would follow (Cranston, EG, Davisville, Westerly). They should put TOD and pedestrian-friendly designs at Providence Station first. Who are they? The Providence Station area already has high-density residential, office, and retail, as well as parks. Granted that individual built projects are barely mixed-use by them selves. Other than the few restaurants fronting Francis Street the mall isn’t particularly “pedestrian-friendly” and that there are several remaining empty parcels that should be developed. What is your concept of TOD and pedestrian-friendly design? What does prioritizing development at Providence Station have to do with expanding the commuter rail system? New commuter rail stations will be built, presumably in hopes of reducing car traffic, but if getting from Providence Station to the office is drudgery, few people will make the switch. “They” are the august Capital Center Commission responsible for the fact that when you emerge from the train station the area is rather barren. It will remain so when the rest of the envisioned big buildings on top of garages are built. Everything you might need to walk to is kinda far and seems even farther than it is. A snack or a quick drink along the way, forget it. The mall is worthless for the “Pick up a little something on the way home” kind of shopping commuters actually need. This is why I am convinced that the latest committee of chauffered bigshots is only going to hand us another Dullsville on the 195 land. “They” cannot force new development on the current surface parking lots or the triangle grass lot along Exchange Street, which are the only opportunities to inject retail for people walking to the station. What “they” can do is require active retail along Exchange Street in the future when development plans are proposed, which could be a long time with the economy the way it is. In the mean time improving the sidewalks and crosswalks might be a more realist short-term goal. The Core Connector project could offer an opportunity to find funding for those kinds of improvements. Besides crosswalk improvements at Memorial Blvd. and Exchange Terrace, a continuous canopy could be proposed from the train station entrance to Kennedy Plaza or the city could allow a modest cafe/news kiosk along the way the to the station. Part of the point of my earlier comment, is that it make no sense restrict or hold hostage the expansion of the commuter rail system, until everything is perfect at Providence Station. There are (currently empty) retail spaces along the Exchange Street facade of the Waterplace Buildings, I think there is one retail space in the ground floor of the BCBS Building along the Exchange Street side (but I’m not positive about that). Also, the section of Union Station that fronts Exchange Street could support one or two restaurant/retail spaces. A lot of retail at Waterplace evaporated when the buildings took too long to build, then when they were finally ready, the economy crashed. I think if we rebuilt Exchange Street to make it more pedestrian friendly there would be more pedestrians and it would become more attractive to retailers. Unlike Westminster, there’s no great effort to push Exchange Street as a place. If we were able to expand the DID to cover Capital Center, then the DID would become a marketer for the area (as well as providing their clean and safe patrols). Improve the pedestrian experience, bring more rail passengers through with the expansion of Commuter Rail in South County, build the street, get someone to be a cheerleader for the area… the retail will come. I also agree with Peter, I don’t like the, “we shouldn’t do this until we do that,” argument. Things don’t happen neatly in order in city building, we shouldn’t wait on good things because everyone isn’t getting good things at the same time. Yes, wrong to say “we shouldn’t do this until we do that,” but it still seems the planning powers only see train stations as things you drive to and park at. I LOVE the canopy idea now that is looks less likely that the streetcar line will not include a direct link to the train station. The canopy would also serve as a great attachement point for better signage linking RIPTA’s KP bus hub and the growing commuter rail service. The canopy would also A) protect the sidewalk from snow clearing and the cost to do so B) prolong the life of the concrete itself, and C) offer other unique opportunities to “tie-in” from other buildings/sites/venues, etc. When Capital Center was planned and the Commission first started meeting, the station was indeed basically set to just be a place to park. The original Capital Center was to have no retail and no residential, it was basically envisioned as an office park on the Woonasquatucket. Luckily, the office park concept failed and the Commission now allows for retail and residential and the remaining Capital Center parcels can be developed in a more mixed use capacity. Unfortunately for the train station, Avalon (which has retail, which is really poorly designed) and Gateway Center were among the first buildings built and they were built under that office park on the Woonasquatucket state of mind. Does anyone have an example of a long canopy covering blocks of a street? I’m trying to picture it and what I am picturing is ugly and ineffective. I can’t see what would keep the weather (snow and rain) from simply blowing in, especially along sections where there are no buildings. I like the idea of a series of awnings where people can get out of the weather as needed. Most transit oriented planning studies indicate the people are willing to walk 1/4 mile or 15 minutes from a stop. Most of the downtown and college hill is more than a 1/4 mile but within a 15 minute walk (according to Bing maps) from the Providence station. Since most people measure in time not distance hopefully there will be takers for the rail. Of course, on a cold rainy day if February…. The new 195 land lies beyond the distance and time that most people will walk. If the streetcar goes through and the time between cars is acceptable a short the 6 min. walk to Kennedy Plaza is not that bad. The current bus frequency would probably not be acceptable to commuters. The question is will the streetcars be in place by the time that land starts being built upon. RIPTA said at the last Core Connector Study Meeting that with current service, they have buses running between the train station and Kennedy Plaza every 1 to 4 minutes (I think that is at the rush hours, not all day/all week). The problem is those buses are confusing, sometimes counter-intuitive, and often circuitous. Buses that directly serve the train station do so on the Gaspee Street (State House) side, meaning passengers arriving on trains leave the exit away from Downcity to catch a bus to Kennedy Plaza, counter-intuitive. Some buses need to be picked up on Francis Street opposite the mall. If you’re going to walk to Francis Street, you might as well just walk to Kennedy Plaza. The fact that some buses are on Gaspee and some are on Francis is confusing. And many buses heading to the train station go up Exchange, then left on Memorial, then right on Francis, and sit in traffic forever and take you away from the train station on your way to the train station. So, RIPTA needs to put all the buses that currently use Francis, onto Exchange to Finance Way instead, then Finance to Francis and on to wherever they are going. There can be one inbound and one outbound stop with amenities like weather protection and maps and such at Exchange and Finance to reduce confusion (there can still be a stop on Francis at the Mall for people go to/from there). There would be a degree of costs, installing bus shelters and whatnot at the train station as well as signage inside and outside the station pointing people to the bus stops. Buses would need to be re-berthed at Kennedy Plaza because a bus currently arriving via Francis may need to be at a different berth than a bus coming in via Exchange Street. There would be new schedules and maps needed. And riders would need to be informed about the changes. Also, the Gold Line trolley currently terminates at Kennedy Plaza, extending that to the train station seems a no brainer to me. I would note RIPTA is on an Advisory Committee (along with DOT, Amtrak, Prov Planning etc) on how to spend both about $1 million of “enhancement” money programmed for the area around the station, and about $3 million for preliminary engineering (but no assured funding for construction) for serious improvements needed at the station, the garage, and the Plaza, involving drainage, failed concrete and limestone, and freight trains carrying hazmat. The stakeholders are considering all the issues raised in above posts, plus parking – for Amtrak employees, bicyclists, and passengers, including drop-offs/pickups and (my suggestion) for short-term to run into station for schedules/tickets. RIPTA is considering using Exchange St to serve the station but tight turns are an issue. To Jef’s points about bus service there, I would add the need for a fare structure that didn’t cost another $2 for the short ride downtown, and a combined train station (also Provdence Place, Capitol Hill) bus access schedule on the 4 lines (50, 55, 56, 57) that go there, the same way there are now combined schedules to the airport (14, 20) Olneyville and Wayland Squares and more. By the way, I represent the RI Association of RR Passengers on this Advisory Committee. I agree that a canopy if designed badly could be horribly ugly. 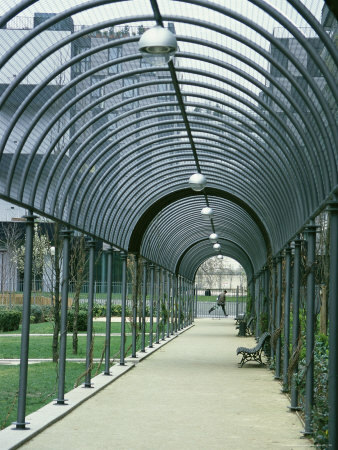 A canopy of that length that would link two important transportation hubs could be an great opportunity to create a dynamic sculptural element in the city landscape. The canopy element could fly over intersections, clearly defining the realm of the pedestrian. The links below show some examples though there could be better ones.